Nominations are now open for 2019 sub-branch representatives. Your sub-branch should hold a meeting as soon as possible to conduct the election process. Click here to see the Election Notification and here to view the Nomination Forms. 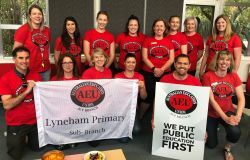 Nomination forms must be returned to the AEU ACT office by 4.30pm Friday 22 February.